I didn’t think anything he said about himself was true. I was a realistic, but when it came to people, one on one, individually, I was an optimistic. People say all sorts of weird things about themselves on the internet to make thems sound interesting. I’m not sure all those particular ‘half’s’ are all that interesting, but I thought it was just an attention grabber. It all started two years after my divorce. I was in my mid thirties. I had four children, but only the two youngest lived with me: Erin, my daughter, and Josh, my youngest son. My two older boys, Benjamin and Bryce, lived with their father in the same area we had all lived together before the divorce: Katy, Texas. Sometime after my father had told me to start dating, I went in to my bishop for a temple recommend interview and he,Bishop Slack, told me that I needed to start dating. I laughed nervously and told him that my father had said the same thing just a few weeks earlier. Is this not a reason for tears if I shed them? Whether for joy, grief or just pure emotion, the tears are there because the memory is beautiful. 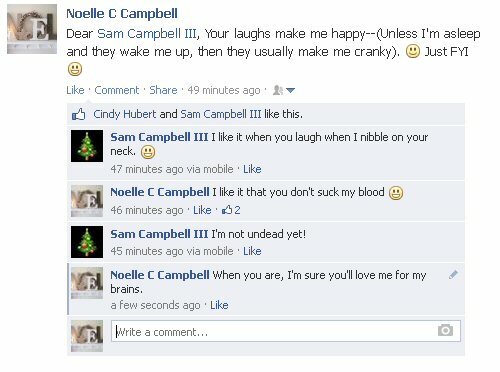 I don’t think you can appreciate how obvious Sam’s feelings were because he not only would grumble, not knowing who was around or in ear shot, but he would type out his grumbles when he was at the computer and just not hit enter. It didn’t matter, however, because his screen was so huge everyone in the room could read it. I had to force myself to not read or to try to pretend as if I hadn’t seen. Sam and his thoughts were literally public almost always. He was always really interested in truth and honesty, but he knew that it was important to not take everything people said at face value. Sam was a scary guy sometimes. He had that wandering eye that wasn’t quite able to focus on you when he looked at you, besides him being blind. Being deaf just made it harder because he would grumble so much louder than he realized. Everyone knew what he thought. It was hard then at first to accept him at his word when he said things that did not agree with his grumbles. It became easier because his actions were so clear that they started to speak louder than his grumbles. In the end, it was clear that what goes on inside our heads, those negative thoughts, all came out with Sam. That was only clear because Sam’s actions: the little gifts of donuts for the kids, candies, flowers for me, going to church with us, going to scouts and young women-sitting in the foyer just to be with us, just for us to be family (as normal as we could be), being cheerful even when he was so tired of his disabilities… All those actions and many more made Sam’s Grumbles something we just ignored as an external version of what normally happens inside. We still love him for all the little things he used to do for us. Now we try to do things we think he would have volunteered for: Feeding families in need, working at the church, helping friends that helped us. I cry almost every day. I want to stop crying and at the same time, I’m afraid that I will stop crying. Does that make sense? There is more to say, but it all sounds selfish and childish upon examination, so I’ll let it go. Maybe if I was a better woman, maybe if I were more Christlike, I would be close enough to the veil to feel you. But even great prophets mourned with sackcloth and ashes. I am not better than they. 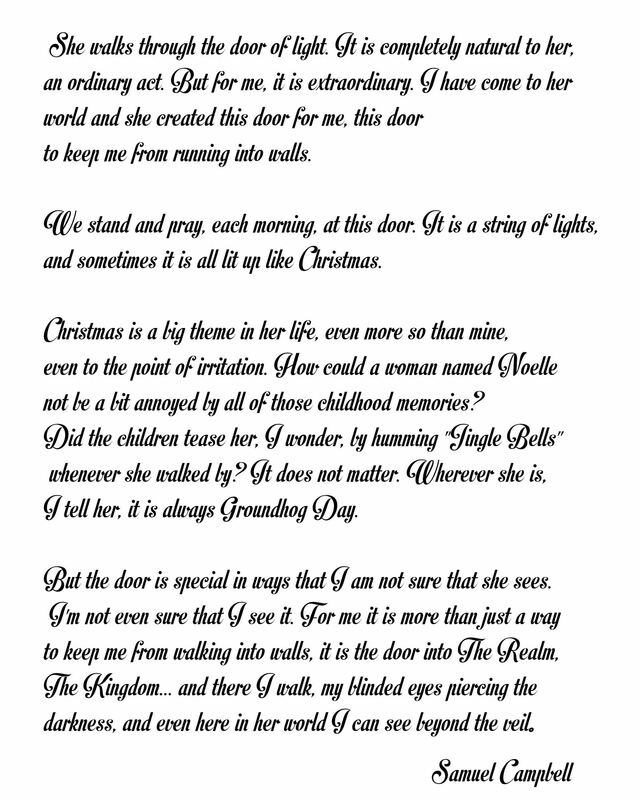 I will always remember this year’s Christmas. Thanks to the generosity of friends, family, and strangers, we had a better Christmas than I had any reason to expect. 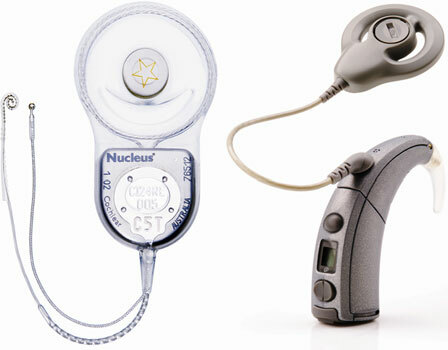 We were able to raise enough money through donations for the 20% co-pay coverage for a Nucleus 6 cochlear implant. It arrived on Christmas Eve. It came by FedEx, though I like to pretend it was delivered by sleigh and reindeer. What’s more, I was able to get another pair of good quality sunglasses thanks to friends in our ward who got us gift cards for Christmas. They are Veza sunglasses, which are only sold at Sam’s Club. I really like the Veza sunglasses because they are incredibly strong and sturdy. Whenever I can scrounge up the money I look forward to adding another pair to my collection. I have three pairs now, and if I don’t lose any of them they should last a lifetime. They’re not a well-known brand, but that just makes them even more special. I feel like I know a secret that most people don’t know. I don’t want much in the way of luxuries. I like sturdy boots, sturdy sunglasses, and a computer with a fast internet connection. I care more about whether something is durable than whether it is fashionable. Anyway, what with a new CI processor and new sunglasses, it was a very deafblindie sort of Christmas. I’ve already set up an appointment with a specialist to have the CI assembled and mapped for the first time. I look forward to switching from the big processor to a BTE (behind-the-ear) unit. It will be a lot more convenient. And fortunately I also have a backup CI that still works, even though it is obsolete. I am practically OCD about having backups: backup CIs, backup sunglasses, backup computers, backup boots, etc. Anyway, it was a great Christmas. And thanks to everyone who contributed to the purchase of a new CI! My Hobbit needs an upgrade! I just put up a Gofundme campaign for my Hobbit’s Cochlear Implant Upgrade. Visit it here: http://www.gofundme.com/5n569o. Here is a bit of the background story: My husband Sam has Ushers Syndrome. He is deaf and rapidly going blind. 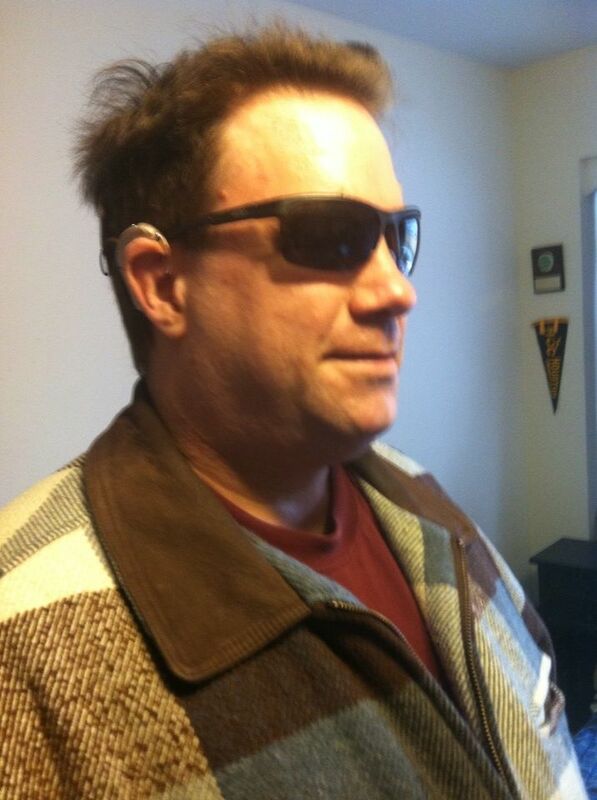 In 2002, his mother convinced him to get a Cochlear Implant and his unit was one of the big Sprint Processor/ Body Worn CI’s like pictured above. Last year, 11 years later, it was so obsolete that we couldn’t find parts for it and the CI processor was no longer compatible with the programs used to update and calibrate it. So we applied for a new CI. Sam’s Medicare covers 80%, but the amount left was still about 1500.00. The people at Cochlear America gave us a generous waiver, but we are still responsible for about 400 dollars of the new processor, fees for follow up doctors (CI Specialists) visits, and the other necessities for upgrading to the new Nucleus 6 behind the ear processor (the object on the left is the CI part that is inside his head and ear and the right is the processor): Our budget is very tight and we can’t really afford 400 dollars, but without the CI, Sam is seriously sensory deprived. We are hoping our friends, family and community members will help us out with this drive to raise money for his implant. There is a unusual level of dysfunction that my family lives with on a daily basis. We all realize that this is not ‘normal’ for most people, not even most blind or deaf people and their family. For us it has become ‘normal’ even if it is not comfortable. The children are well adjusted to it, still able to communicate with their friends while communicating with their step-father in the best ways to be understood. There are still miscommunications. There are still problems that can’t be fixed with a light rope in the hall, clean hallways and regular oil changes. Some things are still unbearably difficult, but somehow, we make it through. Family and friends have been an invaluable resource as have charity, welfare and church. They are all a regular part of our ‘normal’ life. They all lift us up when we feel we are drowning. And we try to be a blessing to all of them in return by serving and returning support. It is a hard, long, difficult road, with many moments of sorrow and frustration, but just as many miracles and sufficient moments of joy. Sometimes the joy seems fleeting and as hard as we try to hold onto it, it slips like sand through our fingers and we hit the next obstacle. We struggle, and we endure. Here is where we share the moments of joy, so we can look back and giggle, smile and remember. There are many more moments of frustration ahead. Sometimes we feel overwhelmed by it, and then a friend appears and we are, as CS Lewis said: Interrupted by Joy. Thank you for being a part of it. A dad had kids who refused to eat end pieces of bread. So he told his kids: “Hey, kids, the end pieces are like rolls. You like rolls, so you shouldn’t have a problem with the end pieces of bread.” So the kids quit eating rolls.